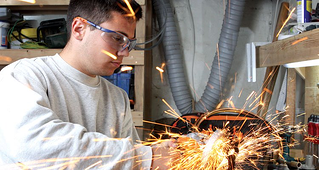 As technology and an increasingly global economy and workforce continue to disrupt traditional work and higher education models, career and technical education (CTE) can offer high school and colleges students a comprehensive set of skills and experiences designed to give them a leg up after graduation. According to the U.S. Manufacturing Institute, the industry will need to fill more than three million open positions over the next decade, as many as two million of which will go unfilled due to a skills gap and shortage of technical education. Yet career and technical education offers benefits beyond just job training for high school and college students; it can offer enrichment for students interested in entering a broad range of fields. Career and technical education classes are a great option for students interested in vocational careers or an alternative path to the traditional four-year college degree after high school. However, technical training and the hands-on skills provided can enhance every student's experience and competitiveness, whether they are interested in pursuing a career in construction, computer science or finance. CTE courses are generally more hands on than traditional academic coursework, and can help improve skills such as teamwork, problem solving, and communication in studeents. Growing developments in technology and automation may be most evident in manufacturing and service sector jobs, but professional and information industries will also experience changes. According to Fortune, as many as two-thirds of U.S. companies across multiple industries report difficulties finding qualified applicants for technical positions, with the biggest gaps in the technology and healthcare sector. Preparing students to meet the demands of the workforce while they are still in high school or college can be an important first step in helping close the skills gap. CTE classes can also prepare students for potentially lucrative and rewarding work, in many cases without the need for a four-year degree. As the costs and debt associated with higher education become more prohibitive for many students and their families, vocational and technical training can serve as a gateway to higher paying jobs, especially with companies actively looking to fill positions with skilled and promising young workers. CTE programs (such as P-TECH, which originated in Brooklyn, NY, and has since spread across the country) implement a 21st century version of vocational training designed to offer high school students the opportunity to learn valuable skills, gain job experience and support from participating sponsor companies and mentors, and complete coursework to graduate with a high school diploma and an associate degree in just six years. Whether they decide to pursue additional training and degrees, enter an apprentice program, or join the workforce immediately after graduation, these individuals are armed with the type of technical training and practical work experience that is applicable across a variety of fields. The benefits of CTE programs go well beyond job training. Students from all backgrounds can reap the benefits of a diversified approach to their education irrespective of their future goals and plans after high school. This means that CTE programs can enrich the educational experience and engage students whether they plan to pursue a bachelor's degree or not. The practical training and technical subject matter can prepare students for collegiate level work as well as a full-time job; it may even introduce new directions and opportunities for students open to exploring different avenues and career prospects. Overall, CTE classes offer diversity in education, training and soft skills that academic courses alone can't provide.